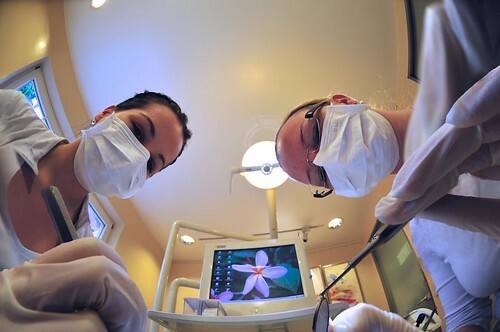 A few weeks ago I took the kids to the dentist for their checkups. Living overseas and finding dentists isn’t always easy, but we’ve gone to this dentist for the past few years. I feel like she knows my kids and understands our circumstances with Jie Jie. Let me back up a bit. In the past I’ve let the kids know and I even “practiced” with them when they were younger. I still get out the plastic toy dentist set beforehand and play dentist with Jie Jie, but this time I didn’t get that done. Bad, bad, bad. She was fine watching the other two get their teeth checked, but when it was her turn that content child left the building. I don’t mean she got up and left, I mean she was no longer content and did NOT like anything or anyone. I was okay. The dentist is great with her and quick. We go to the lobby and wait to pay. Jie Jie calms down and plays with the train set. The nurse comes out with a prescription and tells me about a doctor I need to see. Now I’m confused as to what kind of doctor, especially since she gave me a prescription for the mouth sore. I had not understood the conversation with the dentist. I phoned my husband and gave the nurse the phone. They talked. I listened. She gave the phone back. “I’m not sure what she was saying, but I’m almost there. Just wait,” said my husband. He arrived and talked with the nurse some more. After about five minutes, it was clear that the nurse was telling us that we needed to have Jie Jie tested. She was a little slow for her age. We kindly let her know that she is a special needs child and that it should be on her medical record from the first visit. It was awkward. We left giggling because anyone that has ever met Jie Jie knows immediately that she has special needs. We couldn’t be angry, because for one they were so sweet in how they were trying to tell us. I really felt bad for them. Lesson Learned:Even though you are the only foreign family that visits a dentist and you have been their for years, take your medical information to give to the dentist to look at. It’s better than having awkward conversations like the one we went through. What dentist/doctor stories do you have with your children? Any communication stories? Please share in the comments below. I was young and single when I boarded the plane to begin life overseas. I didn’t put a lot of thought into doctors, hospitals, or any other health related issues. Probably not that wise, I know, but that was years ago and I was young. After I became pregnant I began to look at heath care differently. When my second child was diagnosed with Cri-du-Chat, a genetic disorder, I really studied the whole medical scene. So, how do you handle heath care in a language you don’t understand? This is difficult and often a huge reason why people don’t move overseas. Many times there is a translation problem, and frankly, who wants to vaguely understand what is being said by the doctor. I know I don’t, so here are a few suggestions I have to help. 1. Study the “system”. Each country has different systems and procedures in seeing a doctor. Ask other parents questions like: Do you need an appointment? How do you register? Do I need to go to the hospital or is there an office? In our last move I was fortunate to have a friend who could speak the language and knew the system well. She actually took me to the hospital and showed me how it all worked. If you can take a tour with a friend, think about registering your child(ren) at that time. Taking time to fill out the medical forms = less time to wait for doctor with a sick child. Knowing and understanding the system before the crisis is beneficial. 2. File important medical documents. Put any medical documents such as vaccination records, diagnosis records, and even insurance information into a filing system. It doesn’t have to be elaborate and huge, but it should be in a safe place and easy to find. 3. Make a list of doctors. It is better to have this list before your child(ren) is sick. Ask parents at the school what pediatricians, family doctors, and dentists they like. Find out if they speak English or not. Another idea is to check for an expat website for your city. There is probably a forum for hospitals and doctors where other parents recommend their favorites. 4. Start a medical dictionary. I’ve used a simple notebook to write out medical phrases or words that I needed the doctors to understand. This has really helped with translation problems during a consultation. If you have a language teacher, ask them to help with this or find a friend that can read and write the language. Another thought is to download an English/foreign language dictionary onto your smartphone. This has been helpful for me in other situations, so I highly recommend finding a good one in the language you need. 5. Bookmark a few medical websites. I’m not suggesting that you should check your child’s symptoms online, even though there are some websites that offer that service for free. What I am suggesting is that you use these sites to research what a doctor at the hospital/clinic has diagnosed. Many times treatments and descriptions get lost in translation. I have used webmd.com or have searched on Google to find a description of the diagnosis. I have also used Google to research medications that were given to my child. Internet can be a wonderful tool, can’t it? *Note that if you live in an area where medical availability is limited, then make sure you have your medical records easy to pack; and if you don’t already have emergency evacuation insurance, I’d suggest you look into getting it. It saved our daughter’s life. I’m always up for learning more, so if you have any other ideas that would be useful please share in the comments below. Thanks!